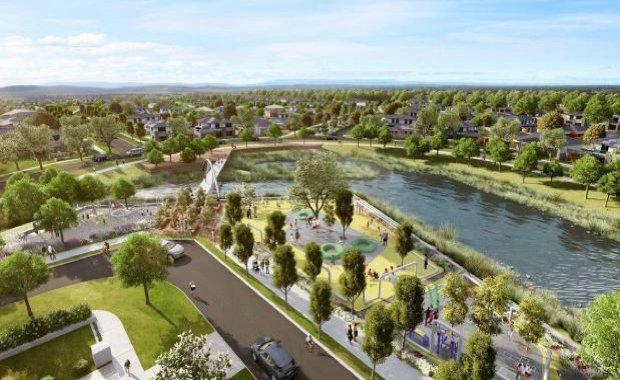 The first stage of 'Aquarevo', Australia’s most water and energy efficient residential development, sold out in record-breaking time, with over 80 families seeking to secure the initial 44 lots. A collaboration between South East Water and Villawood Properties, Aquarevo adopts a unique integrated approach to water management through the use of South East Water’s OneBox® and Tank Talk® technology, along with rainwater used for hot water, recycled water, and solar panels. It's water management systems will ultimately save up to 70 per cent in potable water use and 50 per cent of energy use, making Aquarevo Australia’s leading residential development in terms of water and energy efficiency. Approximately 80 buyer groups had lined up to secure prime lots in the Aquarevo development within hours of the news release. First come, first served, the initial 44 lots were snapped up within hours of their release, with further interest expected for the 460-home community in Lyndhurst, in Melbourne’s south-east. Villawood Properties Executive Director Rory Costelloe said that the result highlights the demand for truly sustainable communities, both in the sense of the advanced environmental initiatives we have developed with South East Water, but also in terms of a desire to live within a community built on genuine and longstanding bonds between neighbours. "At Aquarevo, we want to show that there’s a better way to use water at home – without losing the health and liveability that water provides. "Beyond the ground-breaking water initiatives, each home will include a solar power system with a minimum generating capacity of 2.5 kilowatts. Each home in the community will also be future-proofed to allow for potential advancements, including battery storage and electrical vehicle recharging, which would further improve energy efficiency. The initial release accounts for 10 per cent of the total Aquarevo development, which will extend to 460 lots at the time of completion and be home to an anticipated population exceeding 1,200 people. An additional 50 buyers have expressed interest in the next stage of development, which are due for release in the near future. Aquarevo is at the forefront of the state's water efficiency programs, which are being implemented to support other government initiatives to help secure water supplies for current and future generations of Victorians.